To really nail every stage of the recruiting process, you need sharp instincts. But to transform those hunches into sound strategy that pays off time and time again, you need something more. You need data-driven insights into what candidates are really thinking while being recruited. And for recruiters looking to hire in the APAC (Asia-Pacific) region, we’ve got just the thing. We surveyed over 2,570 candidates across the APAC region to find out how they want to be approached, what they want to hear, the ways they want to learn about your company, and what motivates them to consider switching jobs. Using this information to strengthen your own tried and tested methods, you can make the whole process more enticing and meaningful for the candidate—giving you a competitive advantage. Below are the five top insights into the minds of candidates in APAC that can help you engage with them better. You can also download individual country reports for India, Singapore, Indonesia, Malaysia, Australia, and New Zealand. 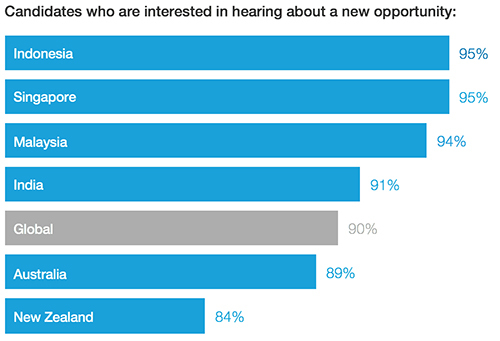 Luckily for recruiters, 90% of candidates around the world expressed that they’re interested in hearing about new job opportunities. In Southeast Asia in particular, that number is even higher, with 94% of candidates open to new opportunities in Malaysia, and 95% in Singapore and Indonesia. Although still a big number, only 84% of New Zealanders are curious about openings. So if you’re looking to hire a Kiwi, you have to work a bit harder to grab their attention with your first message (and consider giving your job descriptions a makeover). That said, 67% of New Zealanders said they feel flattered when you reach out to them, compared to just 63% of candidates globally. So Kiwis don't want to hear from you compared to the rest of the world, but when you do get in touch, they secretly love it. These numbers vary widely in a region as diverse as APAC. 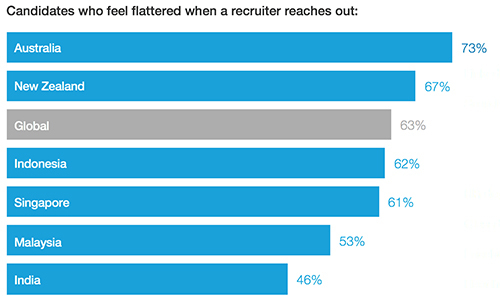 While 74% of Australians are flattered by recruiter outreach, only 46% of candidates in India feel the same way, preferring to hear about jobs from different sources. Indian candidates might not be as flattered by recruiter outreach, but they do really like to hear about job opportunities from both hiring managers and social media. 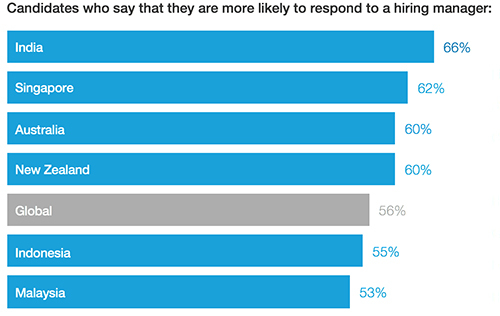 Globally, 56% of respondents said they are more likely to respond to a message from a hiring manager. Across APAC, candidates generally responded well to outreach from hiring managers, but in India, an impressive 66% said they preferred it. People have a natural tendency to react favorably to someone who might be their future boss, so in APAC it’s worthwhile building a strong relationship with your hiring manager to create an unstoppable team. Indian job seekers are also more likely to follow your company on social media to stay aware of job opportunities, with a whopping 63% saying they do this, compared to just 49% globally. This makes sense—the country is the most social media savvy in APAC, and arguably the rest of the world, so building your company’s social media presence in India might just pay off in terms of more organic applications and happier candidates. 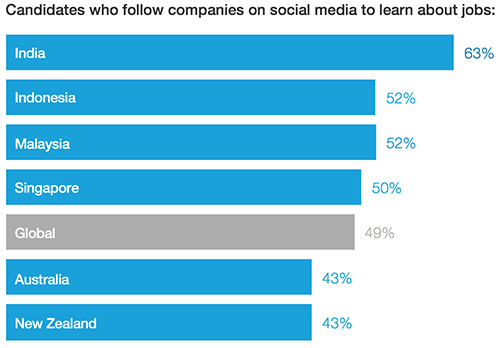 New Zealand and Australia are less interested in hearing about jobs on social media, with only 43% of candidates saying they follow companies for this purpose. For the Kiwis, this might simply be because they’re happier staying put, as mentioned. Although Aussies aren’t paying as much attention to social media while job hunting, they are looking at your company’s LinkedIn profile prior to interviews. 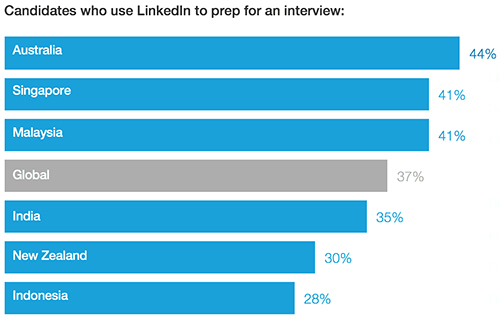 44% say they use LinkedIn to prep by researching the company, the position, other employees, and shared articles. That’s more than the global average of 37%—and almost as much as Aussies use search engines (49%). 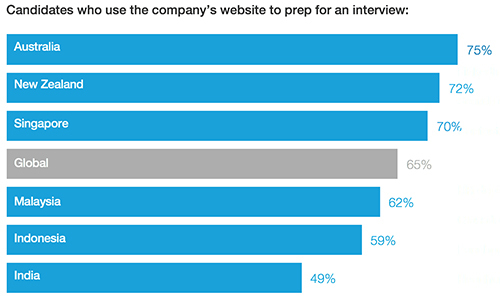 Aussies are also more likely to use your company’s website during interview prep, with 75% saying they check it out, compared to 65% globally. Candidates in both Indonesia and Malaysia noted that LinkedIn played into their decision to change jobs, with as many as 10% more than the global average (35%) saying it played a significant role. Around the world, candidates generally rely heavily on your company’s website while gearing up for an interview. But in India, they seem to trust company websites a little less, with only 49% saying they use it. This could be because Indian candidates seem more inclined to wing their interviews, with 16% saying they didn’t prepare at all while interviewing for their current job. Globally, 11% of respondents brazenly avoided all preparation. Candidates in Singapore and Malaysia get the gold star in job interview preparedness, with only 4% and 5% respectively saying they didn’t prep. Even knowing that some candidates don’t do any prep, it’s always a good time to make sure your company’s website and LinkedIn profile are fully fleshed out and give candidates the information they need to excel. Including your interview process on your website has proven especially helpful for companies like Google, leading to clearer expectations, effective interviews, and confident applicants. A bad interview experience stings, and 65% of job seekers globally said it makes them less interested in the job. In Australia, candidates are even less likely to want the job after an unpleasant interview, with 70% saying it puts them off. 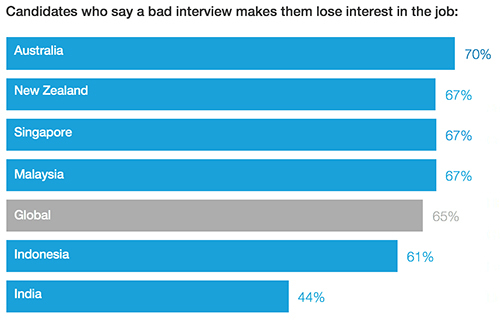 Candidates in India have more tolerance for one bad interview, with just 44% saying it puts them off. This could be because they place more value on other aspects of the process, such as the initial outreach or the offer stage. You know how important it is to nail your interviews, but it never hurts to optimize the process. One area that is often forgotten is the number of interviews you’re putting candidates through—and this leaves plenty frustrated. The data backs this up. Fewer candidates in Indonesia are happy with the number of interviews they experience, with only 74% thinking the number was about right compared to 84% of global respondents. Considering that Indonesians experience more interviews on average (3.72 compared to a global average of 3.13), it’s no surprise that some candidates end up with interview overload. When it comes to the information candidates want to hear in interviews, the top three answers (role requirements, fitting in with the team, and the company’s mission and vision) are fairly consistent across the world. But candidates in Australia (52%), Singapore (54%), and New Zealand (49%) are generally more keen to determine how they’d fit in, with only 42% of global candidates noting this was important to them. This could explain why candidates in all three countries are less interested overall in learning what the salary and benefits package would be like—particularly in New Zealand, with only 22% of respondents interested, compared to 39% globally. 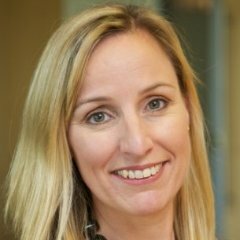 Kiwis are also a lot more interested (57%) in hearing about the company culture from other employees than the global average of 46%, yet are far less curious about visiting the office (arguably one of the best ways to suss out culture), with only 29% saying that was important to them while 51% of global respondents said it was. Money talks in Indonesia, with 53% of candidates saying that hearing about salary and benefits in the interview is valuable to them. Indonesians placed less emphasis on fitting in with the team (37%), and are also much less interested in learning about their responsibilities, with only 60% prioritising this as opposed to a global average of 70%. You’ve worked hard to hone your instincts. With these insights, you can elevate your recruiting game even higher. By understanding what candidates respond to and how attitudes towards recruiting differ by location, you can tailor your process around the thoughts, motivations, and desires of candidates in your region. The result: a smarter, more candidate-friendly approach, and an edge over the competition in tough markets. For more insights into what APAC candidates want from recruiters, download the India, Singapore, Indonesia, Malaysia, Australia, and New Zealand country reports.